The Prime Minister, in a blog, called the Congress culture an “anti-thesis of Gandhian thought” on a day the opposition party is holding a meeting of its working committee in his home state of Gujarat ahead of the Lok Sabha election 2019. (Insider bureru)-Prime Minister Narendra Modi has targeted the Congress on the 89th anniversary of Mahatma Gandhi's Dandi March, which he said "shook the foundations of colonial rule and became a strong symbol of fighting injustice and inequality". The Prime Minister, in a blog that coincided with a key Congress meet in Gujarat, called the Congress culture an "anti-thesis of Gandhian thought" on a day the opposition party is holding a meeting of its working committee in his home state of Gujarat ahead of the Lok Sabha election 2019. "Gandhi Ji taught us to think of the plight of the poorest person we have seen and think about how our work impacts that person. I am proud to say that in all aspects of our Government's work, the guiding consideration is to see how it will alleviate poverty and bring prosperity. Sadly, the anti-thesis of Gandhian thought is the Congress culture," the Prime Minister wrote in the blog on his website. Modi listed how the Congress party worked against everything that Mahatma Gandhi held dear and said that the party has worked against the country. "In many of his works, Gandhi Ji said that he does not believe in inequality and caste divisions. Sadly, the Congress has never hesitated from dividing society. The worst caste riots and anti-Dalit massacres happened under Congress rule," he said. Modi quoted the Mahatma on issues like governance, corruption and dynastic politics among others to criticise the Congress. The Congress and corruption, Modi said, have become synonyms. He quoted the Mahatma as saying that, "it is the duty of all leading men, whatever their persuasion or party, to safeguard the dignity of India. That dignity can't be saved if misgovernment and corruption flourish. Misgovernment and corruption always go together. "Modi said while his government had "done everything" to punish the corrupt and that "… Name the sector and there will be a Congress scam- from defence, telecom, irrigation, sporting events to agriculture, rural development and more." "Bapu spoke about detachment and staying away from excess wealth. However, all that Congress has done is to fill their own bank accounts and lead luxurious lifestyles at the cost of providing basic necessities to the poor," the Prime Minister said. He said the Congress "gave the nation the Emergency, when our democratic spirit was trampled over" referring to the period marked by massive media censorship, restrictions on civil rights and a forced mass sterilisation campaign after it was imposed by Indira Gandhi in 1975. "A firm believer in democracy, Bapu said, 'I understand democracy as something that gives the weak the same chance as the strong'… The Congress misused Article 356 several times. If they did not like a leader, that Government was dismissed. Always eager to promote dynastic culture, Congress has no regard for democratic values." Modi said. "Gandhi Ji had understood the Congress culture very well, which is why he wanted the Congress disbanded, especially after 1947," he said. 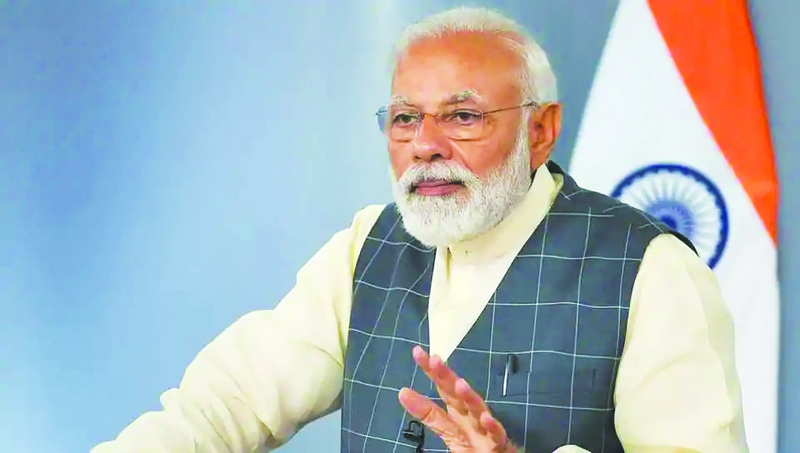 Prime Minister Modi pointed out that the Mahatma saw Congress leaders as busy making communal adjustments and he said in 1937 that "I would go to the length of giving the whole congress a decent burial, rather than put up with the corruption that is rampant." "Thankfully, today we have a Government at the Centre that is working on Bapu's path and a Jan Shakti that is fulfilling his dream of freeing India from the Congress Culture!"